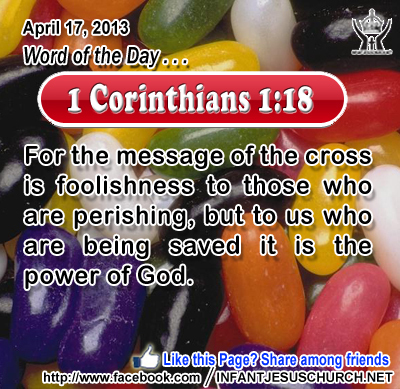 1 Corinthians 1:18: For the message of the cross is foolishness to those who are perishing, but to us who are being saved it is the power of God. Heavenly Father, we praise you for incredible might and power. We also thank you for your love which guides the release of that power. Thank you for knowing that we are but dust without your sustaining Spirit. Thank you for saving us by withholding your mighty power so we could be pardoned by your sacrificial power. In Infant Jesus name we offer this prayer. Amen. 35Jesus said to them, "I am the bread of life; he who comes to me shall not hunger, and he who believes in me shall never thirst. 36 But I said to you that you have seen me and yet do not believe. 37 All that the Father gives me will come to me; and him who comes to me I will not cast out. 38 For I have come down from heaven, not to do my own will, but the will of him who sent me; 39 and this is the will of him who sent me, that I should lose nothing of all that he has given me, but raise it up at the last day. 40 For this is the will of my Father, that every one who sees the Son and believes in him should have eternal life; and I will raise him up at the last day." Today’s Gospel we see Jesus makes three claims. First he offers himself as spiritual food which makes the very life of God within us. Second, he promises unbroken friendship and liberty from the fear of being forsaken or cut off from God. Third, he tenders us the hope of sharing in his resurrection. Those who accept Jesus as Lord and Savior will be raised up to eternal life with Jesus when he comes again on the last day. Do we know the joy and hope of the resurrection? Loving Jesus, your death brought life and hope where there was once only despair and defeat. Give us the unshakeable hope of everlasting life, the indescribable joy of knowing your unfailing love, and the unquestioning faith and obedience in doing the will of our Father in heaven.